Sidney (Lenny Schmidt) and companion (Kim McKean), 1926. 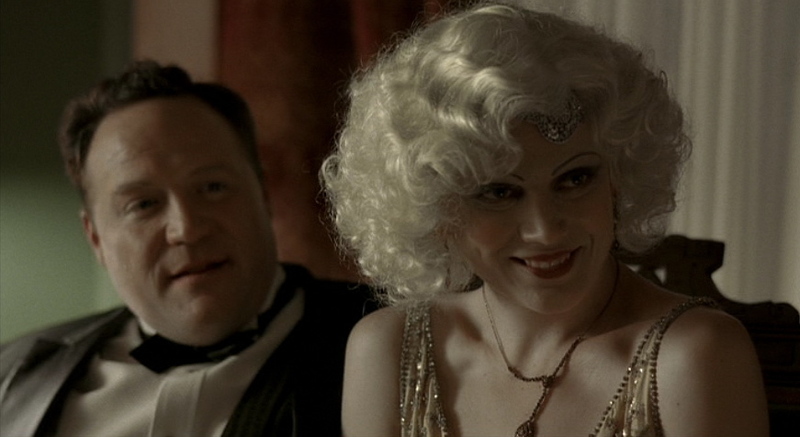 True Blood, Season 2. 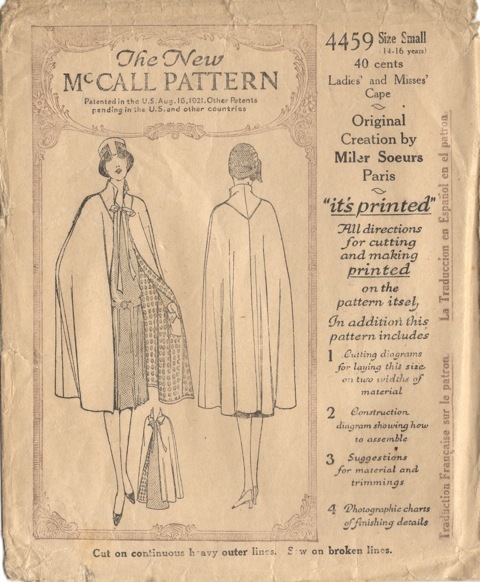 McCall 4459 by Miler Soeurs (1926) Cape. McCall 4459 in the McCall Quarterly, Summer 1926. Image courtesy of Debby Zamorski. As you can see, the verbal instructions simply spell out what the numbered notches already tell you: the order in which to join the pieces together. 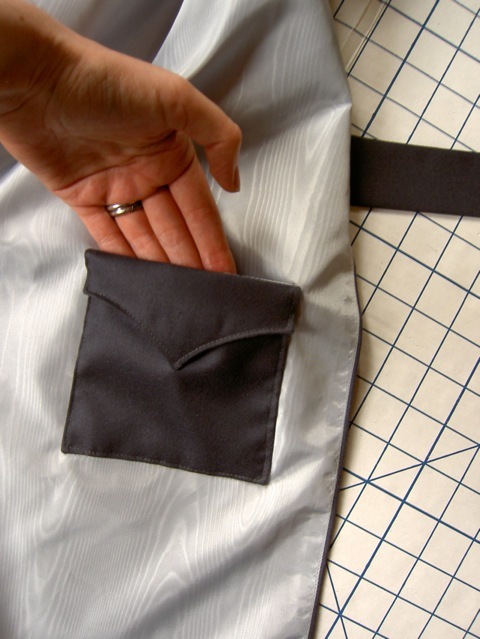 The pattern pieces are printed with further notes, though, such as markings for the pockets and a general indication of where the ties should go. We found some beautiful grey Dormeuil wool-silk on sale at Designer Fabrics as well as a silver moiré lining. The pattern gave no instructions as to interfacing, but to give the yoke/collar some structure I used some hair canvas left over from my wedding dress. 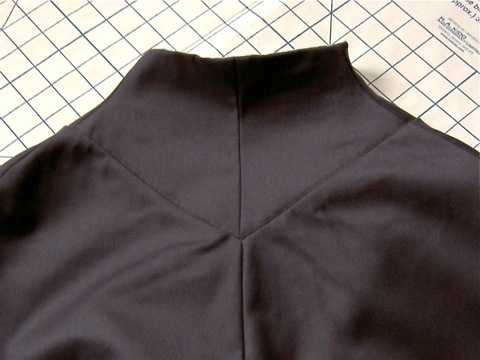 The yoke’s curved seams and points were actually a lot of fun to sew. 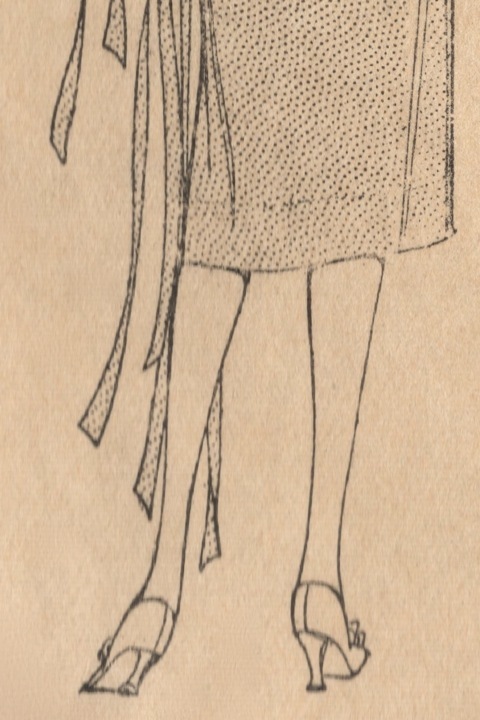 The pattern gave two lengths for the cape; I cut the shorter length, which was also the exact length of the Patou dress. Perfect! Naomi wanted the contrast pockets shown on the pattern illustration, so I made the pockets in wool with the lining inside. The flap is decorative, and I left off the buttons for now. The cape also gave me the opportunity to try out mitered corners. (This is probably more exciting for me than for anyone else.) 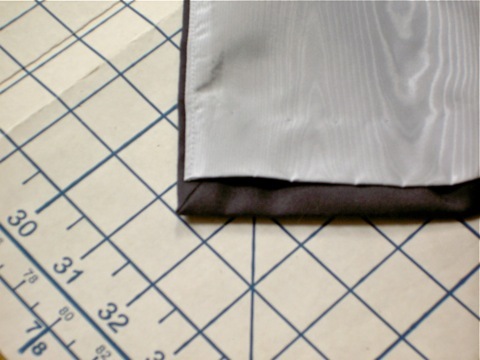 I adjusted the angle of the miter to accommodate the 3/8″ seam allowance. For something made of such light wool the cape is surprisingly heavy—the right weight for spring or early fall here in Toronto. It was a real pleasure to work with such luxurious fabric; somehow knowing it came from an almost 170-year-old French family company made me more patient with the meticulous finishing details required. 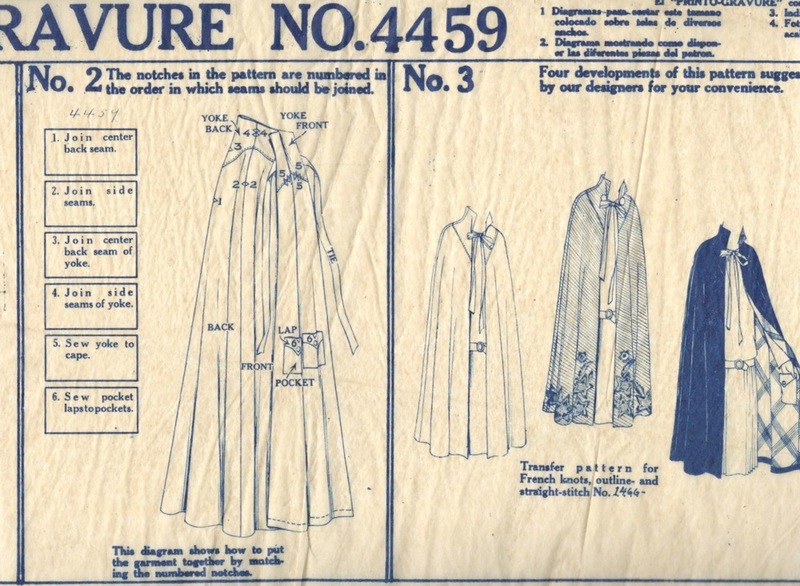 I was tickled to see the company opened its London flagship, Dormeuil House, off Regent Street in 1926, the same year as our four Halloween patterns. The yoke may be the design’s focal point, but I think the finishing contributes to the cape’s general élan. Next: My Halloween flapper evening dress. Oh, did you feel that? It was serious amber waves of cape envy rolling in your direction. 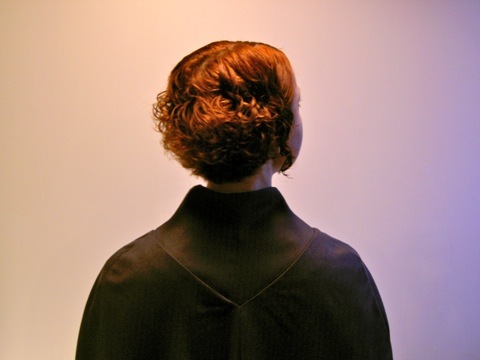 I love that neck and shoulder detail. Just marvelous…..
total stunner. i cannot wait to see your own dress after all of this great work! This is awesome. I want five of these.